PASS will organize a 24-hour online conference about SQL Server at 24-25 of June, 2015. I’m happy to say that I’m one of the 24 lucky persons who will present their sessions to the big community. My session is Offline Database Developing and Unit Testing with SSDT. It will be on 6:00 GMT on 25 of June. In this session I’ll talk about how to create a database project, create database objects such as tables, views, stored procedures, include scripts to fill tables with initial data and deploy it to the SQL Server. And all these are possible using only one tool – Visual Studio. To be correctly, it’s a component of Visual Studio named SQL Server Data Tools. Also we’ll take a look at a new feature of SSDT – database unit testing. Now SSDT allows to create unit tests for the most important parts of database, especially T-SQL code in stored procedures, functions and triggers. SSDT even can debug the code from within the unit test. So join us at 24 Hours of PASS! Don’t forget to check the full schedule of the event http://www.sqlpass.org/24hours/2015/goc/Schedule.aspx. I hope you’ll find something interesting to you. 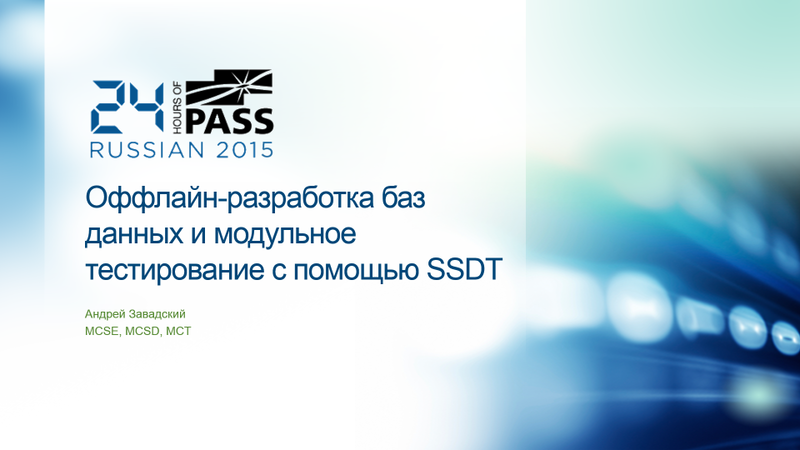 I’m glad to announce that I will hold a full-day training at SQLSaturday #398 on June, 5 2015 (Krasnodar, Russia). As a Microsoft trainer I’ve taught many courses for DBA but I have not seen a thorough education kit that can make a solid base for disaster recovery. So I’ve started to learn my self how to make it efficiently and now I want to share my knowledge with the students. On my opinion, a good skills on disaster recovery are impossible without a good understanding of how SQL Server operates with files through the IO subsystem, what is an internal structure of SQL Server files and so on. That’s why I combine two topics into single course. This training will be about managing database files and transaction log, how to make backup and restore – from simple cases such as full or log backup to a more complicated scenarios like piecemeal restore. We will talk about optimization both the file management and recovery process. Also we mention how to save OLAP databases in SSAS and packages in SSIS. Each DBA meets sooner or later the situation when the database grows and it needs to be moved to another disk, the free space is running out unexpectedly, or that is even worse, the hard drive has gone away and it is necessary to restore the database immediately. You have to work very quickly and, that’s the most important, competently. In this seminar we start from the fundamental basics of SQL Server file management, including data files and transaction log file, take a look how to optimize it. Then we dive into the world of backups – from simple backup and restore to more complicated scenarios such as piecemeal restore. We reveal the secrets how to make backup/restore process faster. In practice we will work with a number of “how-to” scenarios concerning file management and database recovery which DBA can meet in his job. Working with the databases of SQL Server Analysis Services and Integration Services. I will present a session about SQL Server Data Tools. Especially about offline database projects and unit testing.